Bluetrek BIZZ Bluetooth Headset With USB Storage | OhGizmo! By Evan Ackerman on 02/26/08 • Leave a comment! You can never, ever have enough portable USB storage. Especially if that storage is in the form of upgradeable MicroSD cards, and especially if the storage vehicle performs some other useful function. 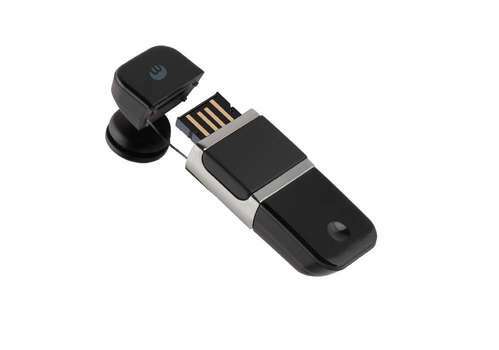 In this case, the other useful function is a bluetooth headset for your cellphone. The Bluetrek BIZZ is a fully functional bluetooth headset, featuring 7 hours talk time, 10 days on standby, and customizable faceplates. Pull it apart to reveal a USB connector (which also charges the headset) and a MicroSD slot. The MicroSD slot is especially useful since you can use the headset as a card reader, or, if your phone also accepts MicroSD cards, transfer pics and video directly to the storage on the headset. The BIZZ accepts MicroSD cards up to 8gb (yay! ), weighs 10oz, and should be available soon for somewhere around $80.